Congratulations to the Clemson Tigers. What a game it was.. The Oklahoma Sooners had a 17-16 lead at halftime, and just knew it was going to be one of those game for the ages. With a National Championship appearance on the line the college playoff Orange Bowl had the atmosphere that kept you on the edge of your seat. So, now that the Clemson Tigers are Orange Bowl Champs and playing for the rights to be National Champions, are you looking for some team apparel to show your team pride? Listed below are retailers who carry t-shirts, hoodies, jackets and hats for children as well as adults. The elite online retailers below also carries big and tall (plus sizes too) for both the Oklahoma Sooners as well as the Clemson Tigers. Get up and celebrate your team's big victory!! 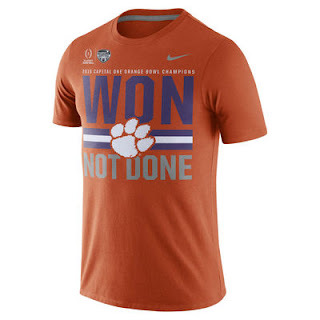 Fans Edge Sports - The Clemson Tigers Orange Bowl champs t-shirt shown above is just one example of all the t-shirts, hoodies, jackets, t-shirts, tank tops etc... that celebrate Clemson's big victory over Oklahoma. Check out the store's company policies and find the store that best serves your needs. Order tracking - If you sign out as a guest you will need fill out a "track my order form" that is available on their website. If you are a registered member (it's free) you can log in to your customer's account. The also have email and phone assistance. International delivery - Yes, to over 100 countries. Women's sizes available - S, M, L, XL, Plus sizes XXL, 1X, 3X, 4X. Sports Fanatics - Great company that has huge variety of Clemson Tigers Championship merchandise and Orange Bowl apparel.. Shop for kids and adult alike. Big and tall, plus sizes are available.